Why Megger Torkel 930 is the best Battery Load Unit available in 2019. Are you Looking for the best Battery Tester? Indeed, the Torkel 900 series is the completely new generation (the fourth one) product range from battery test units manufactured by the world reputed company: Megger. 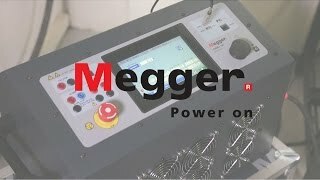 Megger is a leading global manufacturer and supplier of test and measurement instruments used within the electric power, building wiring and telecommunication industries. What Megger Torkel Battery Discharge Key Features are? BVM cell monitor control integrated in the system. If you are looking for regulating the discharge current, you could do it easily with the Torkel Battery Test Kit with in addition, the benefit of a world leading dynamic power and voltage range. How Megger Discharge Test Capabilities works ? The world class battery testing equipment from Megger, Torkel 930 is using Discharge Testing method in order to provide a very comprehensive insight for your battery capacity. Furthermore, the Discharge Testing is a very important and essential part of your maintenance agenda for your batteries. As you may know, the stationary back-up batteries are often or even present in substations but also in many other space like power plants, generation utilities as well as transmission substations. Get your Torkel 900 series from Megger to be able to use while performing load tests or discharge tests which is one of the only way to determine a battery systems actual capacity. What Test to perform with Megger Torkel 930 ? Together with the cell voltage logger, BVM, now connected directly to the Torkel 900, it becomes a complete stand-alone discharge test system. The Megger Torkel 930 is used for battery systems ranging from 12 to 300 V, often encountered in switchgear and similar equipment. The high discharge capacity of Torkel gives the opportunity to shorten the test time. Discharging can take place at up to 220 A, and if higher current is needed, two or more Torkel units or extra load units, TXL, can be linked together. Tests can be conducted at constant current, constant power, constant resistance or in accordance with a pre-selected load profile. Testing can be carried out without disconnecting the battery from the equipment it serves. Via a DC clamp-on ammeter, Torkel measures total battery current while regulating it at a constant level. Furthermore, the high discharge capacity of Torkel gives the opportunity to shorten the test time. Discharging can take place at up to 220 A, and if higher current is needed, two or more Torkel units or extra load units, TXL, can be linked together. The Torkel has built-in protection system against overheating and malfunctioning cooling fans. A built-in circuit breaker is an important component in the safety system. If the temperature will be too high and/ or the cooling fans malfunction, the circuit breaker will trip. There is also a melting fuse connected in series with the circuit breaker. What is included with Megger Torkel 930? Together with the optional cell voltage logger, BVM, connected directly to the TORKEL 900, it becomes a complete, stand-alone, discharge test system. Torkel comes in three models, 910, 930 and 950, see table below. Testing can also be carried out without disconnecting the battery from the equipment it serves. Via a DC clamp-on probe, Torkel measures the total battery current while regulating it at a constant level. Battery systems can be plus or minus grounded or free floating. The Torkel is designed mainly for capacity tests. The Torkel can be programmed to test a battery bank at constant current, constant power, constant resistance or using a user-defined load profile. Torkel can also be used for testing battery chargers and other electrical equipment that require resistive load testing. The BVM (Battery Voltage Monitor) is a battery voltage measurement device that is used for monitoring of cell voltages and battery blocks in battery banks commonly found in electrical power sub-stations, telecom facilities and computer data center UPS systems. Products supplied by Megger are warranted against defects in material and workmanship for a period of one year following shipment. Our liability is specifically limited to replacing or repairing, at our option, defective equipment. This warranty does not include batteries, lamps or other expendable items, where the original manufacturer’s warranty shall apply. We make no other warranty. The warranty is void in the event of negligence abuse (failure to follow recommended operating procedures) or failure by the customer to perform specific maintenance as indicated in this manual. Warranty repair Equipment returned to the factory for repair must be shipped prepaid and insured. Contact your Megger representative for instructions and a return authorization (RA) number. Please indicate all pertinent information, including problem symptoms. Also specify the serial number and the catalog number of the unit. Check also the Megger EGIL on Roynac. The time I need to prepare an order for shipping varies for international shipment. For Shipment in United States is very fast. Usually we need few hours to pack your product and we provide for all our products displayed in roynac.com a same day delivery. Fast Delivery and Free Delivery. We are located in United States! and deliver worldwide wise.